Just got back from a very nice night dive in Union Lake. Water temp was in the 60s, visibility was 4 to 5 feet and there was plentiful lake life to be scene - 30+ crayfish, a huge pike, some bass, blue gill, and lots of smaller fish were seen on the way out to visit the sunken boats of Union Lake. We passed by the sunken Model T Ford on our way - the frame is still there covered in zebra mussels, and a wheel remains near it, shiny and visible. I dove with Chad tonight, he's a ridiculously good diver and is simply awesome in the water. I did a valve drill (here's a great description of the process) with my double tanks (a valve drill is practice for localizing problems that may occur with your tanks and regulators and making sure you can shut down any blown valve or free-flowing regulator and still conserve the rest of your air) worked on my buoyancy, trim, and kicks and had a good time, including a nice, slow, controlled ascent that went like clockwork. Just a nice relaxing dive after being out off the water since the Great Lakes dive trip of August. It was quite serene - sheer blackness outside the range of our lights, a feeling of absolutely nothing existing beyond the time and space of the now underwater, combined with near weightlessness that comes from being perfectly dialed in buoyancy wise (a state I still need to keep working on), it was quite a relaxing way to end a day. Good to get back in. Dora brought a lawsuit for negligence, gross negligence, reckless endangerment, strict liability and breach of implied warranty, and intentional infliction of emotional distress due to I'm the Map Enterprises' mapping route policies. Dora alleges this malfeasance includes mapping instructions with routing through the most dangerous places wholly unsuited for a child and her monkey to navigate including jungles, wild rivers, oceans, unlicensed modes of air transportation, past poisonous snakes, spiders, marching ants, and silly fish. I'm the map never made getting to Abuelas' house simple. - find the coyote - cross the border - amnesty! were similarly defective and resulted in her being picked up by the US Border Patrol and deported back to Mexico. This post brought to you by jet-lag, the kids insisting on watching Dora and the remains of a hard fought mediation. Certainly one of the longest mediations I've ever done -- 14 hours now, and one of the strangest without an end in sight. Without going into details, the opposing side is nucking futz, has more money than Croesus and wants to kill my client, who has little resources and is trying to surrender and yet be able to live afterwards. Not good. In fact the situation doth sucketh most royally. Adding to the fun is that it is now 2:21 am in my head, and 11:25pm local. I'm now blogging in yet another of the interminable breaks as the other side takes its sweet time and devises its next sadistic beating to deliver. Update: After 18 hours straight it settled. Next day I was so wired I got up after 3 hours sleep, wandered around the city then after breakfast went to the airport, got on a super full plane and went home. Of course the plane was so full they were grabbing our carry ons and checking them before we could say a word as they said all the overhead bins were full already. I realized after the gate attendant grabbed mine that I had my car keys in it, so the potential for disaster was high, especially as it had his hastily scrawled hand-written tag with DTW and the flight number on it. Adding to the fun was this was the slowest loading flight ever, departing 40 minutes late on an Airbus A321 and it was 100% full with all of the 185 seats occupied. We were flying back economy this time complete with a lady right behind us with a voice like nails on a chalk board who could not stop talking for 5 hours straight. On the upside the guy in the seat beside us was a neat fellow from Goldsboro NC and we had a nice conversation. We arrived at our stop over in Charlotte NC where we should have had an hour layover, but instead they were already loading the flight to Detroit in the other concourse, so no time for lunch?Dinner? who knows what meal at that point, and we ran over and were some of the last people to get on board, again on a pretty full flight. We figured we were toast as there was no chance our involuntarily checked bags made it (impressively enough the bags did make it). We arrived back in Detroit around midnight, I was home by 1am and quickly passed out. You know you Democrat bill is bad when stalwart Democrats realize that its not just the rich but their core constituencies that will be taxed to pay for it. Unhappy Senate Democrats on Thursday found plenty to complain about in the fine print of the latest health overhaul bill, particularly a tax provision they fear would hit hard at middle-class Americans, from coal miners in West Virginia to firefighters in New York. The opposition sprang up a day after Senate Finance Committee Chairman Max Baucus, D-Mont., unveiled long-delayed legislation that would transform the nation's health care system, requiring almost everyone to buy insurance, making insurance companies cover people with pre-existing medical conditions and reining in spiraling health care costs. Democrat Senator Baucus has introduced the Democrat Senate's Health Care Bill. The details of course make it interesting. Instead of having Presiendt Obama's public option to subvert private health insurance companies and lead to nationalized care, Baucus proposes Instead of the so-called public plan, Baucus went with nonprofit cooperatives. Guess who are some of Baucus' biggest campaign contributors? Nonprofit Health Insurance provides such as Blue Cross. It's the best Democrat Senate poitical contributors can buy. Blogging has been light recently as I've been really busy at work and no time to blog during lunch or otherwise. Now I'm about to experience my first real legal travel experience. I've been around various courts all over Michigan but this is the first out of state work travel for me. So I'm psyched. I'm now headed to San Francisco for a mediation hearing on behalf of a client that should prove to be quite interesting. Wish me luck as its a big one and a lot is riding on it. Just landed in Phoenix on thew way. The client sprang for an upgrade at the airport to first class on the flight to Phoenix as it was longer which was very nice of him. First time flying first class and I must say it was a very fine way to travel by air - a nice lunch, a pleasant and helpful flight attendent, and a nice sized seat with decent leg room, not to mention getting to board first and get off the plane first. Sky Harbor airport in Phoenix is very nice indeed, and makes the Smith Terminal at Detroit Metro seem downright dilapidated, colorless, and user-unfriendly by comparison. Now waiting for the flight to SFO, which will be economy, but shorter. I'll have pics of San Francisco taken and posted as time permits. Dammit Jim, I'm an attorney, not a cop! I'm not a cop and I don't play one on TV either. Kind of expensive and a fair bit more than the badge you got in the Cracker Jack box, hmmm? Macomb County Sheriff Mark Hackel said last month "The Attorney Badge" looks too much like a Sheriff's and said his deputies will arrest anyone carrying one. 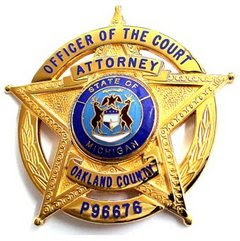 But Officer of the Court, the company selling the badge designed for lawyers, says Hackel is off-base. "Sheriff Hackel is giving bad legal advice," company president Trish Guzik told the Macomb Daily. "He's actually acting as a rogue cop, using his uniform to give bad legal advice." The customizable badge is sold online at OfficerOfTheCourt.com for $120 to licensed attorneys and is designed to counter "non-attorneys representing themselves as attorneys to the public." Guznik argued the badge is not illegal because it's not an exact replica, pointing out the badge has only five points (Sheriff's have six) and is inscribed with "attorney" and "officer of the court." "No one could construe this as a police officer's badge," she told the Daily, promising her company would pay the legal expenses of anyone arrested for wearing the badge. The Michigan State Bar provides an annual membership card and said last month the badge will not replace that document. In a released statement, the SBM said it "does not endorse or recommend the purchase of 'The Attorney Badge' and cautions its members regarding its use." "I cannot even believe they put this thing out there," Hackel told the Oakland Press last month. "They want it to look like it's from a law enforcement agency. My concern is that you will have people out there trying to portray themselves as police officers." The police tend to take offense at people, wannabees or otherwise who try to pass themselves off as such. This is why those "US Taxpayer" or "CCW Permit Holder" badges are similarly dumb. Think about it, what are you going to do with an attorney badge? It is not issued by a government entity, grants you no privileges, isn't going to get you out of a speeding ticket like the real thing does, and may get you arrested for impersonating a police officer. What attorney could possibly resist? President Barack Obama declared Monday that modern benefits like paid leave, minimum wage and Social Security "all bear the union label," as he appealed to organized labor to help him win the health care fight in Congress. Not quite, indeed as to Social Security not at all. Not as bad as Al Gore remembering his mom sang him "look for the union label" when he was a child (it was attached to that silver spoon of his no doubt). But still pretty historically ignorant. Social Security was hardly created by Unions. It was first put into practice by Bismark in Germany in 1889 (with a retirement age initially of 70, older than the average German's life expectancy at the time - kinda sneaky those Krauts eh) and then adopted by FDR in the 30s. Indeed, the Social Security Administration's own official history of Social Security shows precious little union influence, if any at all, in having Social Security passed. Sometimes you wonder why the Feds would let a multiple murderer roam free. Clinton Township -- The Nazi keeps a nice yard. The home of Johann Leprich -- a death camp guard at the notorious Mauthausen Concentration Camp in Austria where 120,000 people were murdered during World War II -- has geraniums, a tomato patch and a manicured blanket of grass the color of emeralds. Adding to the incongruity are two ceramic deer prone beneath a blue spruce tree and a statuette of a cotton-tail bunny. Leprich has long been ordered deported from the United States for lying about his past, but he managed to avoid it due to loopholes in the law. Now, after decades of legal limbo, there may be a country willing to take him and try him for war crimes. But a knock at Leprich's door last week revealed no one. Could it be that the Nazi has again disappeared down a rabbit hole? Leprich, 84, illegally entered the United States in 1952 and was awarded citizenship in 1958. The blue-eyed, silver-haired Romanian-German lived the good life, buying a tidy ranch house on Capper Drive for $10,000 in 1976 and making a living as a tool-and-die man. Eventually, the law caught up to him. In 1987, a Detroit immigration judge stripped him of his citizenship for lying about his death camp service on his immigration application. Inexplicably, Leprich was released pending a deportation hearing. Predictably, he ran. Leprich would have lived out his days in peace, if he had not been hounded by Steve Rambam, one of the world's great Nazi hunters, and his associate, Bob Kowalkowski, who had been hired by a group of New York businessmen to find Leprich. The gumshoes tracked the Nazi to his house in 1997. Still, it took six more years for the feds to come get Leprich. Federal agents found him cowering in a secret compartment beneath his stairs. He was arrested and the authorities waited three years for Germany or Hungary or Romania to accept him. After those countries refused to take him, the American government released Leprich in 2006 and removed his electronic tracking bracelet a year later. The Department of Justice issued this terse statement: "We continue to seek his removal to another country," said Laura Sweeney, a spokeswoman. So Rambam returned to Clinton Township to knock on the Nazi's door. Rambam tried the neighbor. She answered, wary like a hen in a strange barn. She would not open the screen. The detective inquired about the whereabouts of Leprich. "He's such a nice man," the old woman said in a thick Mittel-European accent. "He shared tomatoes. He volunteered at church. It is not possible." "I think it's disturbing that you make excuses for this guy," Rambam answered. He explained to her that Leprich not only volunteered for service at the concentration camp but that he belonged to the elite Death's Head Battalion of the Waffen SS, one of the most brutal outfits in the Nazi regime. "Do you think that when you take him that your people are coming back?" she said through the screen. "My people?" Rambam asked with an arch of the eyebrow. "Yes, I think that maybe you are a Jew?" She giggled. "You have to watch out for those Jews," said Rambam, a Jew. "I forgot about it," said the old woman. "It's best." Simple, there is no justice. For 60 plus years now there's been a deliberate policy of indifference on the part of the government to let these Nazis live the good life here in the US and get away with their crimes. It has not been a good summer for Nazi death camp guards hiding in the United States. Other suspects in the Spanish probe, Anton Tittjung and Josias Kumpf, both living in Wisconsin, may be deported. A fourth suspect -- retired Ohio autoworker John Demjanjuk -- was deported from the United States to Germany earlier this year. And then came news earlier this week that yet another war criminal living in Detroit -- John Kalymon, an 88-year-old retired autoworker living in Troy -- faces deportation. A federal judge determined that Kalymon was a member of the Ukrainian Auxiliary Police who fired shots while rounding up and deporting Jews during the war. Kalymon cried on his front porch Monday, telling an Associated Press reporter: "I love this country because it's my country. I'm going to die here," he said. As for Leprich, no answer at his door. His neighbors claim they haven't seen him in months. Someone must be cutting his grass and weeding the tomatoes. "If he's not home, I don't know where he is," said Joseph McGinness, Leprich's Cleveland-based lawyer. "But the (federal government) doesn't want this kind of publicity. It looks ugly taking a guy out of his house in a wheelchair, putting him on an airplane and taking him to Germany and try him. I doubt he'll go anywhere." In other words, kill enough people, hide or just live somewhere the government is indifferent about for long enough and you'll be just fine. Great moral lesson there. And so Rambam, the Nazi hunter, stood in Leprich's driveway, having got his man, but his man still getting away with it. "I'm astounded," he said. "He's a killer, a murderer, and he's living the good life within driving distance of Holocaust survivors and no one seems to care." Strangely enough, the government filed a criminal case in 2003, Case # 2:03-mj-80485-JU against Leprich for his fasification of immigration documents and failure to report his change of address, and in 2006 the government dismissed the case on the basis that Leprich was deported (when in fact he wasn't). JOHN M LEPRICH, born 1925, Address: 36059 CAPPER DR, CLINTON TOWNSHIP, MI 48035, (586)791-2276. Anybody from ICE have time to go get a warrant, search his house, and pick him up on the deportation order? Update: In addition, Debbie Schlussel has helpfully pointed out, via email, that she has thoroughly covered the Johan Leprich affair on her blog. A newly formed coalition of education, labor and social service agencies calling itself A Better Future for Michigan said this morning the state should reform its tax structure and raise nearly $3 billion a year in new revenue rather than relying on spending cuts to balance the budget. Basically, government workers and beneficiaries of government largess are calling on the government to raise taxes to give them more money rather than cut excess spending that they perform and benefit from? This is supposedly news? • Close tax loopholes for business to raise $600 million. • Impose sales tax on what the group's leaders called "luxury and nonessential" services (like entertainment, recreation, landscaping and spa treatments), raising $1.65 billion. • Reinstate inheritance taxes to raise $100 million. • And seek voter approval for a graduated income tax that would raise about $600 million a year in new revenue. The graduated income tax would have a top rate of 6.9% for high wage earners, with others paying the current rate of 4.35%, and lower income earners paying 3.9%. What could possibly go wrong? More business killing taxes, taxing "luxuries" like entertainment and recreation that employ lots of Michiganians (how about that Pure Michigan thing? I though recreation and tourism in Michigan is essential to our economy? ), adding an inheritance tax on top of the federal one to scare off rich folks from living (and spending) here, and raising taxes on the "rich" which is of course anyone making more than them. Must be nice to think you can raise taxes with no ill-effects. Raising taxes is the Michigan Democrat's answer to everything, even in the midst of our one-state depression. Its the wrong answer, but its the only one they've got. Justice slowly begins 60 years too late . . . This Nazi auxilliary fellow has been a resident of the United States for 60 years, enjoying our good life, living well, while his victims have never had such opportunities. Kalymon arrived in the United States in 1949, became a naturalized citizen six years later and went on to work at Chrysler. He has acknowledged lying about his police job on his application as a displaced person but only because he feared being sent to the Soviet Union. He was been stripped of his citizenship in 2007. 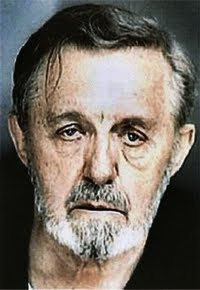 In March 2007, a federal judge stripped Kalymon, a retired Chrysler factory worker, of his citizenship, saying he had concealed his past when he immigrated to the United States in May 1949 and finding that Kalymon had assisted in the wartime persecution of Jews including sweeps of the L'viv ghetto and, the government said, "hunting for Jews." So it still took 2 years just to get to this stage after losing his citizenship where he has to show up for a deportation hearing. It's certainly taken long enough to get to this point, and this deportation isn't punishment enough for his crimes, ut the USA will certainly be better off without harboring Mr. Kalymon and his ilk in it. One down, likely thousands still to go and time keeps ticking away letting more of them remain here enjoying their freedoms and their golden years that they denied to their victims.